We’re running a 3 session Intro to Orienteering course aimed specifically at absolute beginners and novices – all ages, walkers, joggers, runners, individuals, families and groups of friends – all welcome. If you’re wondering what orienteering is like and whether it’s for you try watching this video made by a couple of Junior runners in one of our neighbouring clubs – don’t worry, tumbling routines are not compulsory to be a good orienteer but I couldn’t find any videos of anyone doing it at walking pace. There’s also a lot of information in the blurb and FAQs on our New to Orienteering page. OK we can’t guarantee to be able to make you run as fast as the lads in the video but we will make sure you have as much fun while you’re learning. We’ll provide the specialised maps, tuition, advice and tips – all you need to bring is a pair of trainers/trail shoes you don’t mind getting a bit muddy. Oh, and a friend if you want to share the laughs. 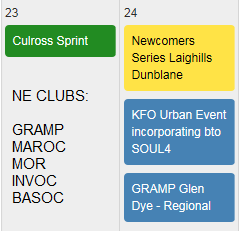 As well as the 3 sessions this also gets you club membership valid until the end of the year which in turn gives you discounts on lots of things including entry fees to all orienteering events. To register, download this form and email it back to us to grampoc@gmail.com, or use this online form. Any questions before you sign up? Feel free to email us on the same address and we’ll do our best to reply promptly.